Holy and Wild: the Carnival de Resistance came to life for the first time in Harrisonburg and Charlottesville, VA during September and October 2013. This traveling arts carnival, village demonstration project, and a school for cultural transformation around the themes of environmental justice, resistance, and radical theology stirred up good conversation and shone a light on the exciting projects that were already happening in each city. A remarkable group of seventeen artists and activists from the US and Mexico came together to share nine theatrical productions, do a variety of service projects within the wider community and live together, using alternative energy to make food, get around, and compost waste. For me, a Word and World Board Member and one of the lead Carnival Organizers, this Carnival experiment drew me into deeper reflection on how as Sarah, one of the Carnival Crew members wrote in a litany: “the struggle of the earth and the struggle of the people are one.” The productions focused on the four elements: earth, air, water, and fire. Through ritual embodiment, songs of celebration, litanies of lament, theatrical teachings, and an evening that always ended in a dance party we tried to share difficult prophetic messages in a way that sparked conversation and reflection. Each performance wove together stories of how the destruction of the earth’s resources both in Biblical times to today is intimately linked to the oppression of people. For example in Earth night we told the story of King Solomon using slave labor to clear-cut the cedars of Lebanon in order to build his palace and the Temple of the Lord. Then current stories were shared, like the one from Christian Peacemaker Teams in Colombia who are walking alongside displaced peasant farmers who are experiencing physical and economic violence at the hands of multi-national corporations planting palm oil on their lands to sell to the Global North. Below is a picture from Earth night of some of the Carnival Crew members singing a song of lament. In addition to the theatrical performances another stimulating part of the Carnival was working to embody the Gift Economy in a number of ways. Building on a belief in abundance and a “theology of enough,” the Potlatch Ceremony, was one powerful way we began to live this out. Borrowed from First Nations Peoples in the Pacific Northwest, the Potlatch is a ritual of wealth redistribution. Status was gained by how much one gave away as opposed to how much one hoarded. In both Harrisonburg and Charlottesville, we invited our local partners to join us for the sharing of a meal and gift exchange. 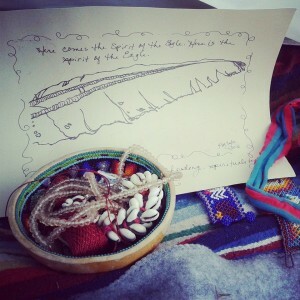 Stories were told, songs were written and shared, handmade jewelry and dream catchers were exchanged. Often there was a special gift that someone had made for a specific person and offered it to them at the beginning of the Ceremony. One example of this is in the picture below where Paulette, a professor at EMU, gave a picture she drew of an eagle’s feather to Paola, one of the Carnival Crew members. For me it highlighted again the lessons in the wilderness after the Exodus: only take what you need for today and do not store up extra for tomorrow. God will provide for us all. It made me question my attachment to my “stuff” and remember again how much I have accumulated that could be redistributed. What people groups have suffered because I have taken more than I need? As I lived outside for a month and ate food gathered from dumpsters and donated seconds of veggies from a local farm I realized how little I needed to still live in abundance. For more information on all of our experiments you can check out the website: www.carnivalderesistance.com. There is lots of energy to keep the Carnival travelling to new communities in the coming years. If you would like to support that effort we would welcome any financial donations you would be willing to contribute (See donation link on the website). If you are interested in keeping up with where we are going next, “like us” on Facebook at: https://www.facebook.com/carnivalderesistance. Thanks to everyone who supported us along the way with your gifts, prayers, and presence! We could not have done it without you!